Brian Robinson Machinery (BRM) was one of the earliest agricultural machinery dealers to be approved and fully authorised by the National Sprayer Testing Scheme (NSTS) in the country. BRM customers have been able to use our testing service to see them through the NSTS requirements since 2004. NSTS has been fundamental in the UK agriculture industry since being introduced in 2003. All farmers adhering to the UK Crop Assurance Scheme, Sustainable Use Directive and respective supermarket requirements have to pass this form of testing. receive its pass certificate and be qualified to be used in the agriculture sector it must pass the first 30 key tests. The following 10 are not required, but advised, and the final are optional element. Every single test that is carried out is to ensure that the machine runs effectively and efficiently, and that the machine is safe for both the operator and the environment. Overall, there is a lot of information to consider, but BRM can guide you through a NSTS test with minimal fuss. BRM is one of the 230+ approved NSTS testing centres in the UK. As one of the oldest, BRM has built an excellent reputation for competitive pricing and great service. Pete Clark now has a wealth of experience and has been qualified NSTS examiner for over thirteen years. 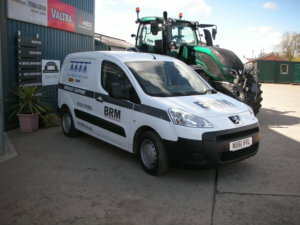 Our two other testers are qualified technicians with many years’ experience repairing agricultural sprayers. We can provide a pre-test check list to help you prepare your sprayer and we also send out reminders letters to inform you when your next test is due. So with our help, you can take care of your annual NSTS needs and keep your sprayer at its economic best. 28m – £198.00 All Prices quoted include pass certificate. We can cater for other types of sprayer. So please call us to discuss any specific requirements you may have that are not listed in the pricing above. After completing the NSTS test, you will be informed of any repairs that are needed. Either fix it yourself or let our experienced technicians take care of it for you. Travel charges will incur when sprayer testing is done at your premises. However, speak to your neighbours as we don’t charge when there are 2 done together.